Went for a short boat ride this morning. As John mentioned, it was plenty warm. Too hot for Miss Lucky, and a bit too warm for Miss Lori as well. We launched at Fort Madison IA. and were greeted by the local welcome wagon ducks! 17 June, picture by Miss Lucky! What $3 a gal gas? Izona! At the docks in Muscatine, IA, 29 June 2007. What a glorious day for a boat ride! Jaime Lynn "Jeff shot" or another view! Jessica Marie upbound at a high rate of fuel consumption! JANICE MARIE sitting proudly in her slip in Muscatine Harbor! Good lookin old Gal! What a day we had! Hope you all like the shots, and wish you were all along for the ride. That's all for now, but I took several shots of each boat so let me know if you need any other pictures. I'll be happy to send along. Hope to go again tomorrow or Sunday. Another new boat for the Izona list! Caught the GILDA SHURDEN downbound just below the BNRR bridge earl this morning. Is this boat too cool or what! Picture by Tim 30 June 2007! Gilda Shurden - one last shot! CLERMONT sad looking and sitting alone needing some TLC. Melissa K, north of Burlington waiting for a project! Clermont -- A lot of history here! This was NASA's first towboat! COOPERATIVE VENTURE & BURLINGTON building a tow in the fleet north of Burlington. 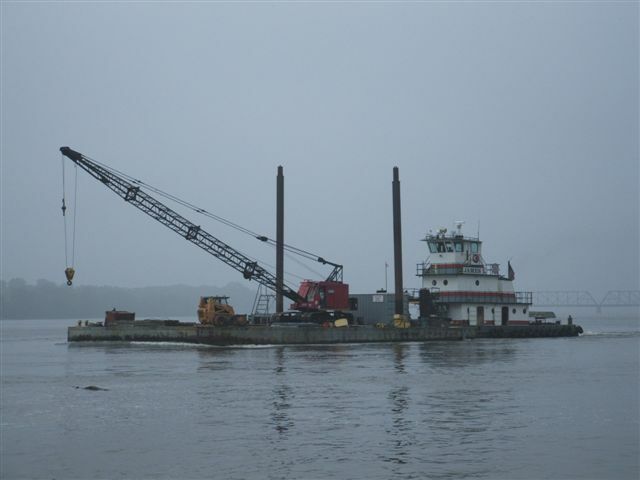 The Skipper and crew of the Cooperative Venture were headed to St. Louis with a full 15 barges! Caught this big guy sunning himself!